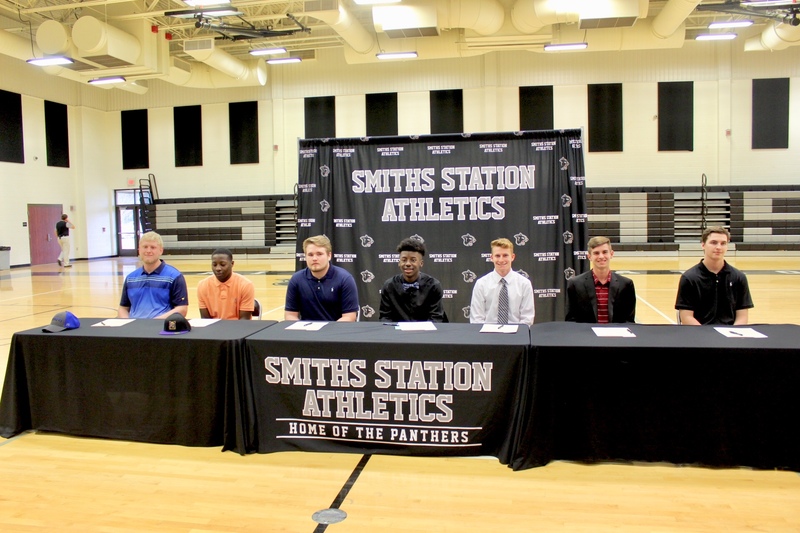 Seven Smiths Station High School athletes realized their dreams of competing at the collegiate level today during the school’s “National Signing Day” event. 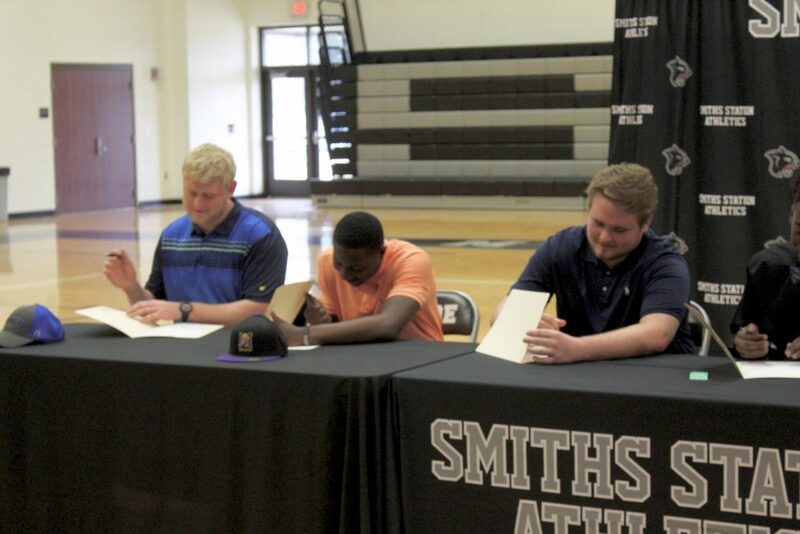 A total of four football players, two track and field athletes and one baseball player inked their scholarships featuring introductions from their respective coaches. 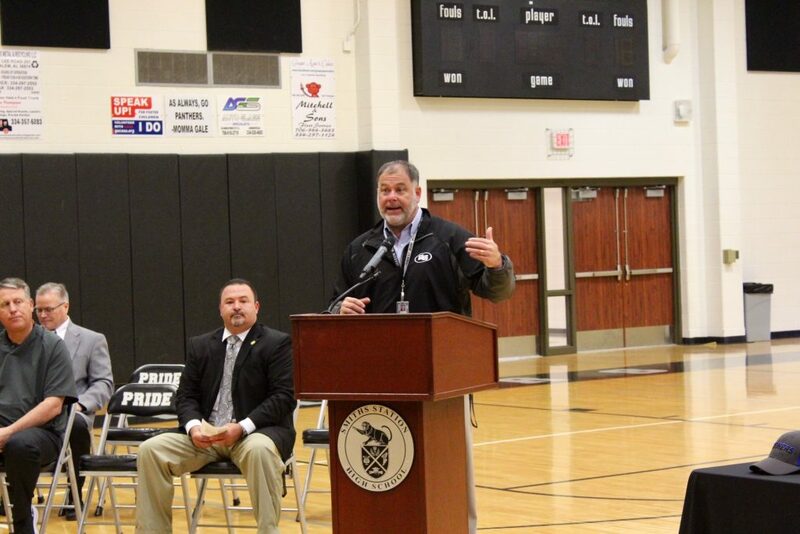 For coaches Mike Glisson and Ron Peters, signing day is a culmination of the hours of hard work and sacrifice these athletes have dedicated toward being competitive in their respective sports. “To me, this is the most important day (of the season) for these guys. Winning games and championships are great, but when you help a kid get a chance to live out his dream, that’s something that’s hard to come by and something that not many jobs allow you to do,” Glisson said. 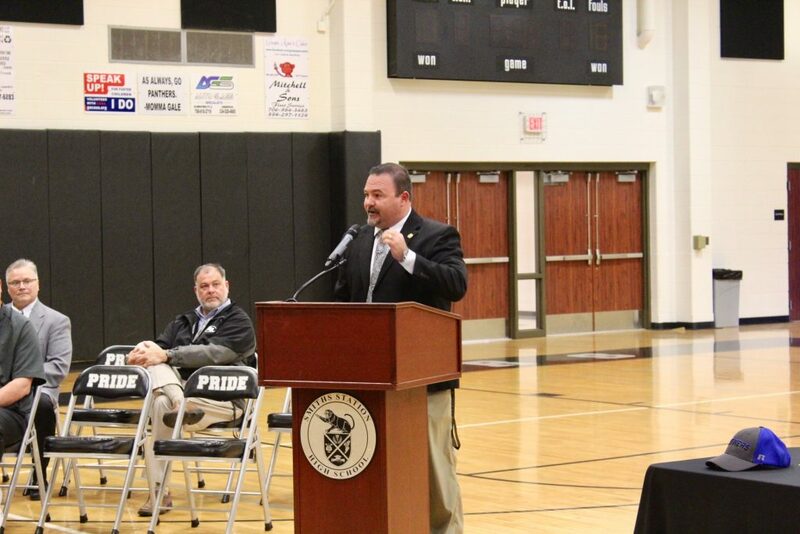 As the leader of the Panther’s track and field program, Peters said he was beyond humbled to see two of his athletes and others have a chance to pursue their dreams. “All of these guys right here are going to do a fantastic job in representing their hometown, Smiths Station High School, their family and their former teammates. We’re very proud of all of you, especially my two guys for putting up with me,” Peters said. Baseball – Sterling Evilsizer, committed to Wallace State University. At 6’5”, 200 pounds, Evilsizer’s size and pitching abilities made him a coveted prospect. During his high school career, he received playing time as a pitcher, first baseman and right fielder. Football – Anthony Gosha, committed to Georgia Knights Prep Academy. Gosha’s frame and speed allowed him to play on both sides of the ball, as an outside linebacker and slot receiver. Cameron Jones, committed to Highlands Community College. At 6’5” and 305 pounds, Jones used his size and athleticism to play as a tackle on both sides of the line of scrimmage. He will play tackle at the community college level. D.J. Miller, committed to Miles College. Miller’s 4.5 40-yard time enabled him to line up at multiple positions, including defensive end, outside linebacker and safety. He is currently listed as an athlete and will find his natural position during the summer or fall. Chad Strickland, committed to Eastern Illinois University. Track and field – Tristan Breen, committed to the University of West Alabama. Breen shined as an indoor and outdoor track competitor during his Panther career, and helped lead the school to become Class 7A Section 2 team champions last season, winning a total of four tournaments. Silas Franklin, committed to Troy University. 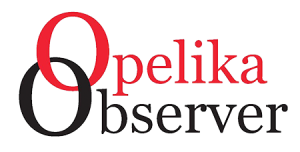 Franklin garnered statewide attention after placing third out of 175 race finishers during the AHSAA state cross country championships last season. He was also named as a member of the All-Bi-City Boys Cross Country team in 2017. 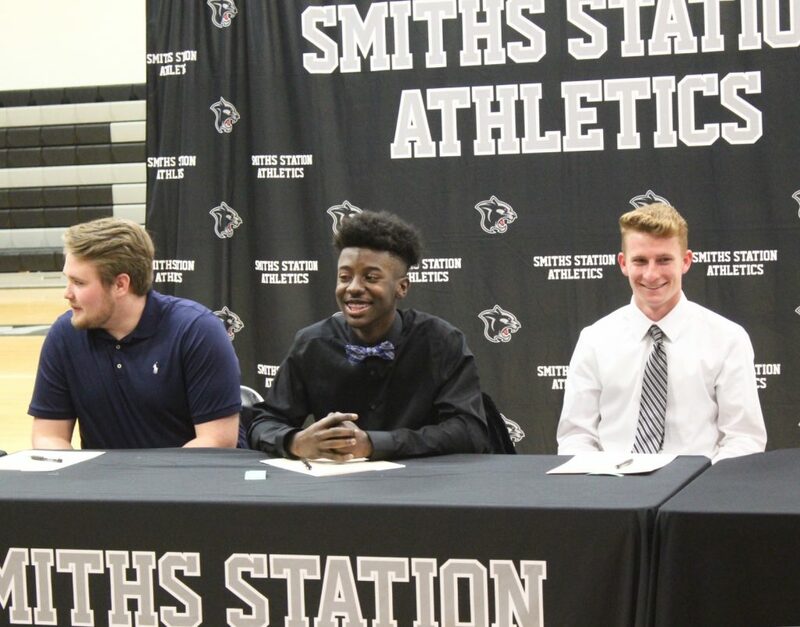 Two Smiths Station football players declined to make their selections today and will wait to announce until later in the recruiting cycle. For more information, like and follow the “Smiths Station Athletics” Facebook page or visit www.lee.k12.al.us/SSH. View other photos from today’s event in the photo gallery.